'Help yourself to the blood-cakes, little one,' coolly enjoins Julianne Moore as witch Mother Malkin in Sergei Bodrov’s demented fantasy. Such ripe dialogue abounds as Moore and Jeff Bridges struggle valiantly to make sense of an effects-heavy adventure, inspired by the novel The Spook’s Apprentice by Joseph Delaney. 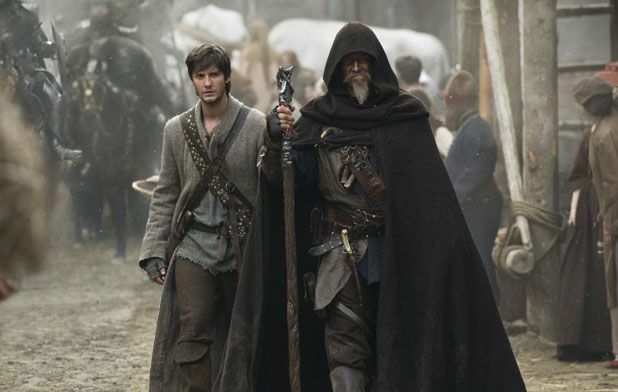 With the action taking place in a unspecified medieval land, Ben Barnes plays Tom Ward, the seventh son of a seventh son, who becomes apprentice to Master Gregory (Bridges). Gregory is the last survivor of a monastic order of ‘spooks’ who are dedicated to eradicating the influence of supernatural forces, specifically Mother Malkin, who has the power to transform herself into a dragon. Despite Gregory’s warnings, Ward rescues another witch, Alice (Alicia Vikander) from an angry mob and falls in love with her, little suspecting that Alice is being used as part of Mother Malkin’s plans to defeat Gregory. The presence of Kit Harington – from last year’s similarly daft money-pit Pompeii – signals the sub-Game of Thrones nature of this romp, with capable performers including Olivia Williams and Djimon Hounsou lost in a stew of expensive-looking idiocy. Oscar-winners Moore and Bridges may well be taking the money and running, but thankfully they leave behind a plethora of memorably silly moments for connoisseurs of truly bad films to treasure. General release from Fri 27 Mar.